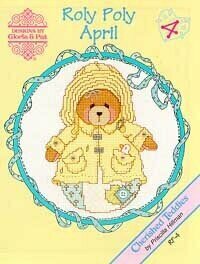 April Showers bring May Flowers....this month's Cherished Teddy is dressed in her best yellow slicker and is ready for the rain! Stitch Count: 89H x 66W. Stitched on either 14 ct antique white aida or 28 ct cream linen using DMC floss & DMC metallic floss. 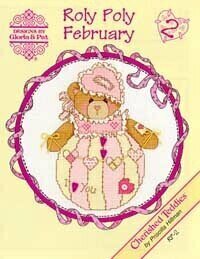 This sweet Cherished Teddy is dressed in her prettiest heart covered dress. She's here to tell a special someone that she loves them very much! Stich Count: 89H x 67W. 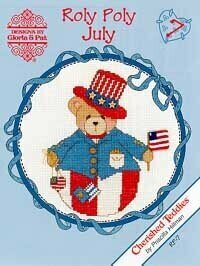 Model stitched on either 14 ct Antique white aida or 28 ct cream linen using DMC floss. 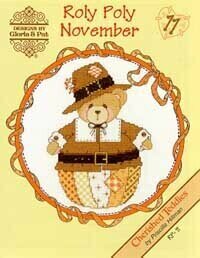 November's Cherished Teddy is dressed as a pilgrim and ready for the Thanksgiving feast! Model can be stitched on either 28ct cream linen or 14ct Antique White using DMC floss. Stitch Count: 88H x 65W. 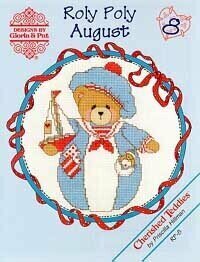 Let's go sailing with August's Cherished Teddy! Stitch Count: 90H x 74W. 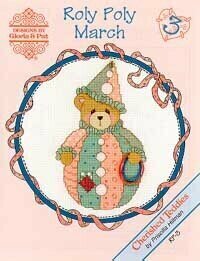 Stitched on either 14 ct Antique white or 28 ct cream linen using DMC floss and Mill Hill Beads. December brings us a festive Santa Claus ready to celebrate the season. 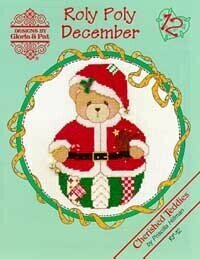 Model stitched on either 28ct Cream linen or 14ct Antique White Aida using DMC floss. Stitch Count: 89H x 62W. This cute little Roly Poly Cherished Teddy is dressed for the cold weather and is ready to play! He's carrying a bag full of snowballs just ready to throw! Stitch Count: 88H x 66W. Model stitched on either 14 ct Antique white or 28 ct cream linen using DMC floss and DMC metallic floss, also Mill Hill Beads. 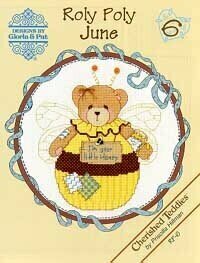 This adorable Cherished Teddy is dressed as a bee - "I'm Youre Little Honey!" Stitch Count: 88H x 78W. Stitch on either 14 ct Antique white or 28 ct cream linen using DMC floss & DMC metallic floss. The Flowers of May are here! 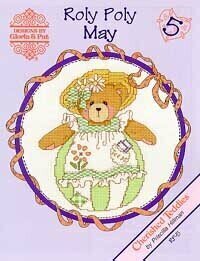 May's Cherished Teddy is ready to start on the flower garden! Stitch Count: 89H x 75W. Model stitched on either 14 ct Antique white or 28 ct cream linen using DMC floss. 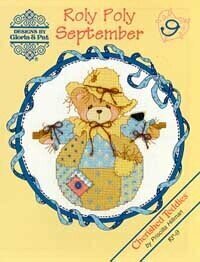 What could be cuter than a Cherished Teddy dressed as a scarecrow? He's too cute to scare anyone away! Stitch Count: 86H x 79W. 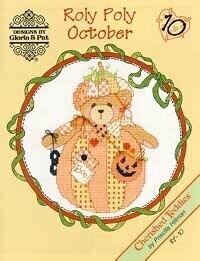 Stitched on 28 ct cream linen or 14 ct Antique white aida using DMC floss and Mill Hill Beads.